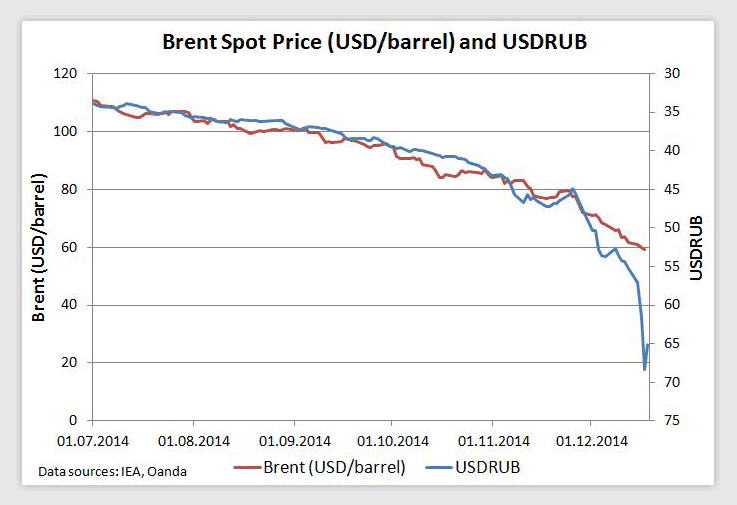 This week has exposed the Russian economy to be an oily black one trick pony. Fossil fuel price increases seem to represent Putin\’s growth and stability plans A through D; with Plan E being the secret weapon plan called “Hope”. As Brent went through $60 this week the FX traders basically blew the Rouble away in a couple of days of massive sell offs despite the Russian Central Bank hiking interest rates by 7% to 17%. Oil has recovered somewhat as short traders cover their positions and there was a slight draw down on inventories but this price recovery could yet prove to be a dead cat bounce if Morgan Stanley are right in suggesting that the cash cost of production at circa $40/bbl may represent the only true floor to the oil price. The Rouble has recovered too; but the suspicion is that Moscow has “instructed” Russian companies with FX reserves to sell them for Roubles. What happens when those run out is anyone\’s guess. BASF have pulled out of a massive gas asset swap with Gazprom so the sanctions are also continuing to hit. Meanwhile warmer than expected weather coupled with a revision of the new year temperature forecasts to balmier numbers has driven down gas on the front and back. Electricity contango is still heavy but gas again might be worth a nibble – but not perhaps a main course portion.